Mustang is a magical world of the unknown with great archaeological mysteries, deep-rooted history, and a culture of its own. 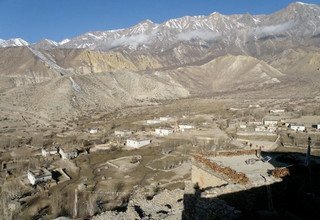 Upper Mustang is also known as the “Last Forbidden Kingdom” as foreigners were not allowed to enter until Nepal Government lifted the restrictions in 1992. 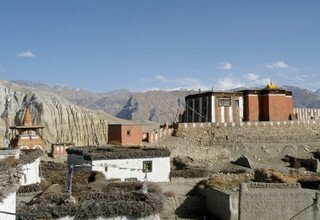 Trekking in Upper Mustang is the exploration of thousand-year-old monasteries, caves, canyons, desert beauty, cliff-faced landscapes, local tribes, and their incredible culture. Mustang Circuit Trek starts with your arrival at Tribhuvan International Airport in Kathmandu. After a brief stay in the valley, the trip begins as you take a scenic flight to Pokhara and then to Jomsom. The flight to Jomsom takes you through the deepest gorge in the world, Kali Gandaki River. 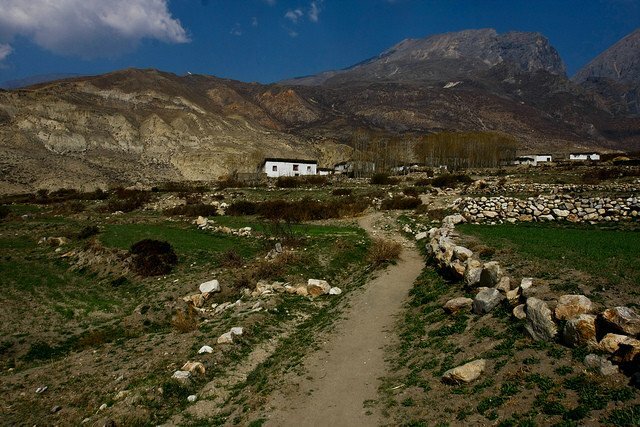 Upon arrival in the windy town of Jomsom, your Mustang Circuit Trek starts as you walk to Kagbeni on the dry terrain. 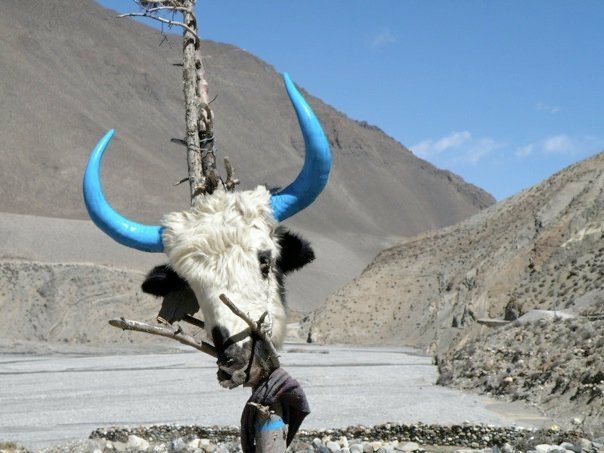 After Kagbeni, the trail continues alongside Kali Gandaki River and you will be required to cross many passes as you explore the restricted areas of Upper Mustang. 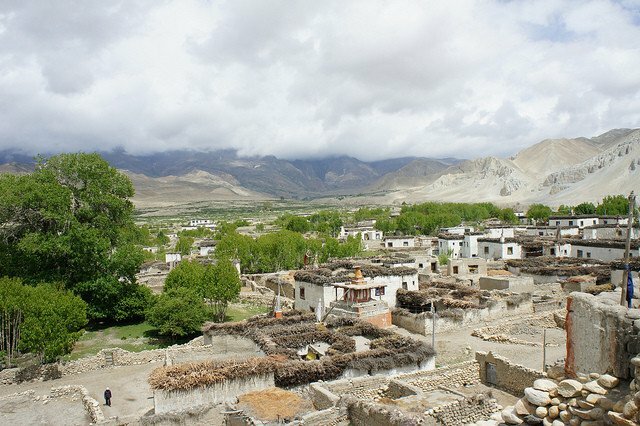 It will be an enticing trek to the walled capital of the former Kingdom of Lo in Lo-Manthang. 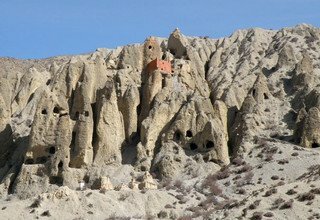 Mustang Circuit Trek takes you to ancient monasteries and caves that hold sacred value to the people of the last forbidden kingdom of Tibetan Buddhism. En route, you will pass through several narrow alleyways, herds of domesticated animals, and long walls of prayer wheels. 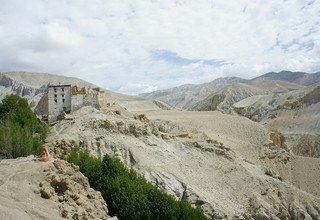 Mustang Circuit Trek features the most unique landscape of Nepal and allows you to have an insight into the practice of Buddhism. 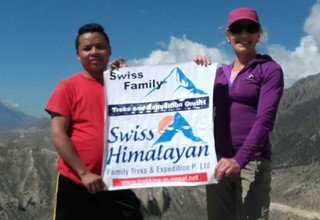 Swiss Family Treks and Expedition provides you the best trekking experiences in the Nepal Himalayas. Best known for its quality of service, Swiss Family Treks and Expedition has 15 years of experience in the field of travel and tourism. We provide you with English speaking guides with years of experience and knowledge to make your trip worthy and full of fun and excitement. Our excellent trek packages allow you to have a memorable time in Nepal. 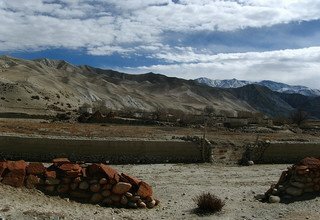 explore the formar Himalayan kingdom of Upper Mustang and its beautiful landscapes. The trip begins with your arrival in Kathmandu. One of the company representatives will come to welcome you at Tribhuvan International Airport. Then you will be transferred to the hotel in our private van. 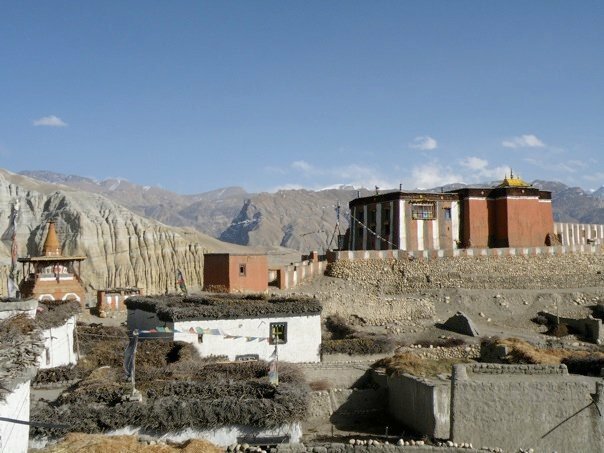 As Upper Mustang is a restricted area to foreigners, you will require the permit to pass through the checkpoint. After acquiring the permits, you drive to the airport and take the afternoon flight to Pokhara. It will be a 20-minute flight to Pokhara where you can enjoy the magnificent views of the Himalayas such as Machhapuchhre (6993m), Annapurna massif, and Dhaulagiri massif. Overnight in Pokhara. Today, you leave Pokhara and take an exciting flight to Jomsom. 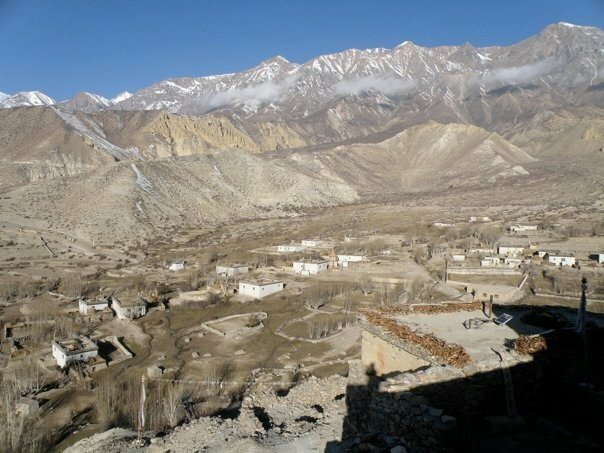 Jomsom is famous for its strong winds and breathtaking landscape. After some rest in Jomsom, the trek begins with the walk on the riverbed of Kali Gandaki River. The trail is mostly flat and filled with uneven rocks and sand. 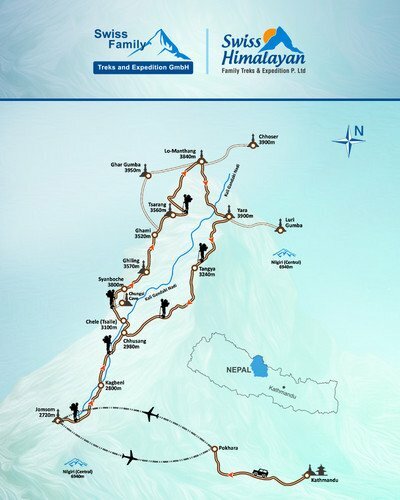 You can view the peaks of Dhaulagiri (8167m) and Nilgiri (7061m) ranges on the way to Kagbeni. Kagbeni is a traditional town with narrow alleyways and ruins of the ancient fortress. Overnight in Kagbeni. 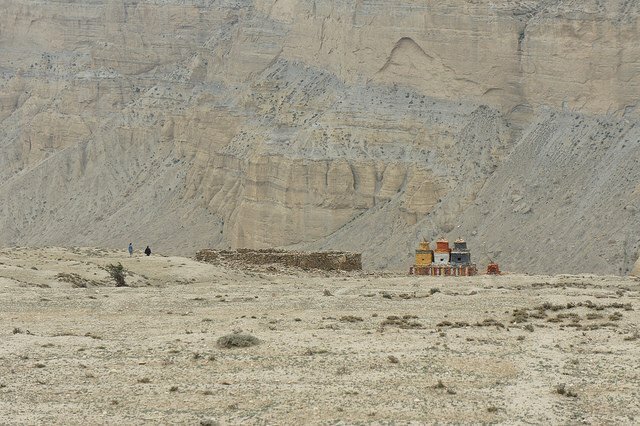 After getting the permits checked in Kagbeni, you enter the restricted area of Upper Mustang. 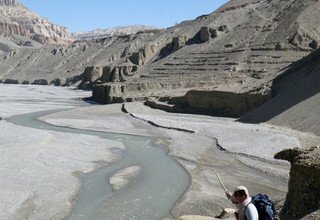 The trail follows on the eastern bank of Kali Gandaki River and you will walk mostly on sand. You can see some caves on the western side of the river. You arrive at the Gurung village of Tangbe where you will have lunch. Tangbe has red and whitewashed houses. Then, you cross Kali Gandaki River and climb up the steep trail to reach Chele. Chele is a small settlement from where you can overlook the beautiful valley. Overnight in Chele. Today’s trek is difficult as it involves some steep climbs and descents. You will cross the Taklam La Pass (3624m) and Dajori La Pass (3735m), and descend on a pleasant trail to Samar. About two hours from Samar is Rachung Cave. It is a cave which looks as if it has been stuck on the vertical wall. The trail goes through a forest of green bushes and small trees. You then cross a river and descend along a ridge to reach Syangboche. Overnight in Syangboche. In the morning, you climb up to a small pass from where you can see the Ghiling valley spreading out in front of you. Then, you walk through Ghiling village and cross Nyi La Pass (4010m). 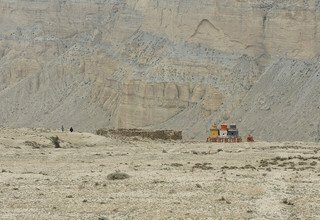 You continue the trek further and pass the longest Mani wall in Mustang. After crossing a stream, you walk through the terraced fields and arrive in Dhakmar. Overnight in Dhakmar. After breakfast, you leave Dhakmar and ascend a steep crumbled gully and cross some alpine meadows. 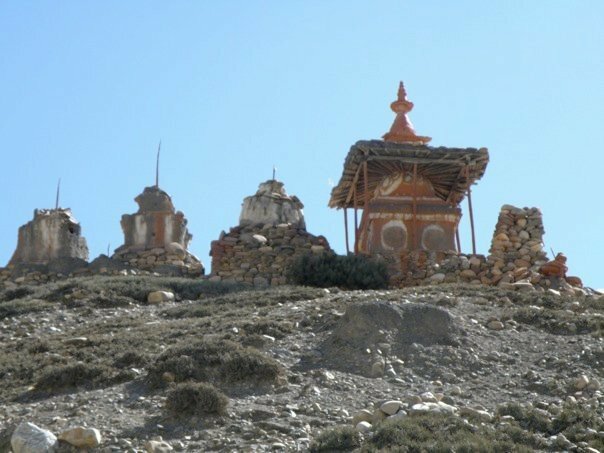 You climb a ridge and keep descending until you reach Ghar Gompa. 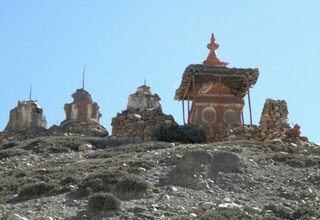 It is one of the oldest monasteries in Mustang, which was built by Guru Rinpoche in the 8th century. After Ghar Gompa, the trail descends to a wooden bridge over Charang Khola. Then, you climb up and keep walking until you arrive at a ridge in Marang. After having lunch here, you cross Marang-La Pass (4230m) and descend to a small ridge. 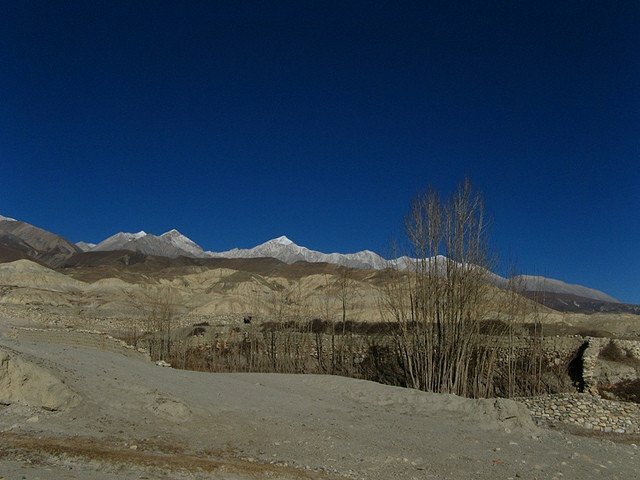 You follow the crisscrossed trail and arrive at the walled capital of Lo-Manthang. Overnight in Lo. 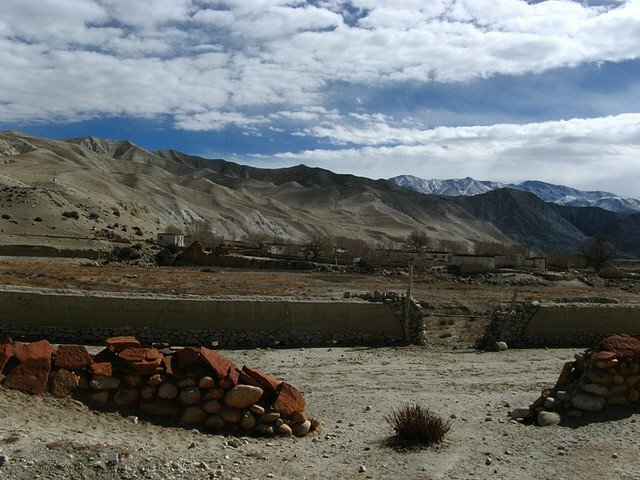 Today, you head for the mysterious Chhosar village. If you wish, you can ride horses or ponies to get to Chhosar from Lo-Manthang. You explore Niphu Monastery and ancient caves which are about 2500 years old. 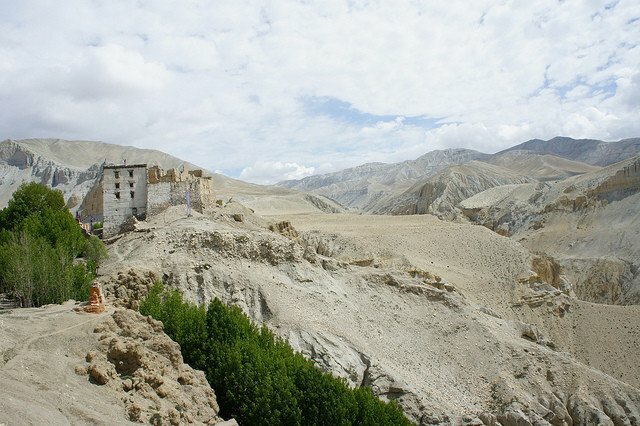 Jhong Cave is the largest man-made the cave in Upper Mustang. It is fascinating as it is five stories high and has more than 40 rooms. 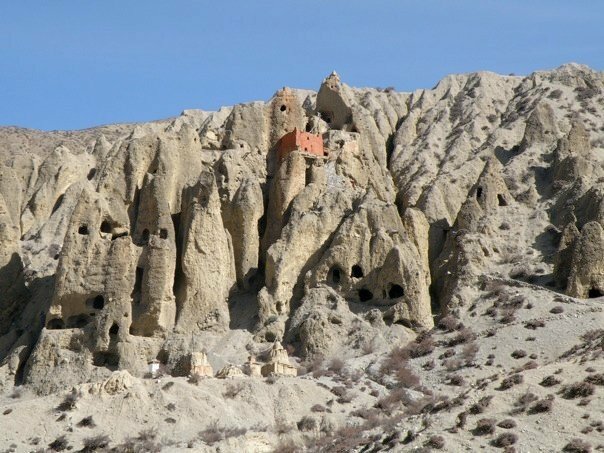 These caves hold the secrets from the past centuries as they are decorated with Buddhist murals and Tibetan scripts on ancient parchments held by worn wooden covers. You return back to Lo-Manthang in the afternoon and explore the palaces and fortress of the capital of the former Kingdom of Lo. Overnight in Lo. 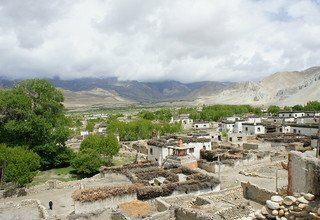 You leave the beautiful village of Lo-Manthang and move to Yara. First, you ascend gently until you reach Dhi La Pass (3950m). It will take an hour to reach here. Then, you make a steep descent and pass a canyon to reach Dhi village. Walking down along the colored canyon, you arrive in Yara. Overnight in Yara. Following the river route, you hike to Luri Cave Monastery. It is set on a ledge at least a 100m from the ground. The winding footpath from the bottom of the valley will take you to a single entrance which leads into two chambers; the outer chamber and the inner chamber. The outer chamber is a shrine whereas the inner chamber is decorated with a series of paintings. These paintings are believed to be made during the 14th century or even earlier. After exploring these chambers, you retrace your steps back to Yara. Overnight in Yara. It will be a long and difficult trek today. First, you make a steep ascent and then the trail continues downside to Dhechyang Khola. You will find Shaligrams (fossilized black rock collected in the riverbeds) all around the place. The trail then steeply ascends and takes you to the top of a small pass. Then, you cross a large plateau and reach Tangge village. Overnight in Tangge. You start the trek to Chhusang early in the morning. First, you cross a suspension bridge and follow the short river route. Then, it will be a climb for around 3 hours. After reaching Pa (shelter house), you take a short break around the small water spring and have lunch. Then, you cross many small passes and reach the top of a ridge. Encountering the strong winds, you steeply descend to reach Chhusang village. Overnight in Chhusang. It is the last day of trekking as you head back to Jomsom. 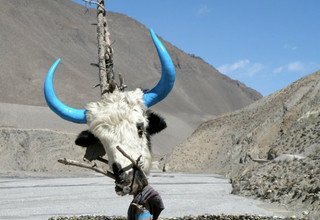 You follow the same way from which you came to Upper Mustang. After the climb, over the rocky trail to Tangbe, you descend to Kali Gandaki riverbed. You walk along the banks of Kali Gandaki River and reach Kagbeni. 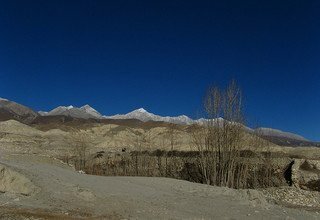 After having lunch in Kagbeni, you follow the motor trail and arrive in Jomsom. Overnight in Jomsom. It will be an early morning flight back to Pokhara. The view is absolutely amazing as you pass over the mountains and the gorge of Kali Gandaki River. In the evening, you can enjoy the lakeside or visit the pubs and local bars in Pokhara. Overnight in Pokhara. It is a reserve day for flight delay/cancellation, so you can get a quick tour of Pokhara before heading back to Kathmandu. Phewa Lake is one of the most preferred tourist sites as you can do boating there or just relax at the beach. You can also visit the World Peace Pagoda or go for paragliding. Then, you take the afternoon flight back to Kathmandu. Overnight in Kathmandu. After a fulfilling breakfast at the hotel, our company representative will accompany you to the airport to connect you with your scheduled flight back home. * 5 nights accommodation with breakfast at3*** hotel in Kathmandu and standard hotel in Pokhara. * Restricted area special permits (USD 500/ 10 Days). * All transportation by private car/van. * Guide & support staffs and their insurance, foods, accommodation, transportation and salary.